Dr. A.P.J. 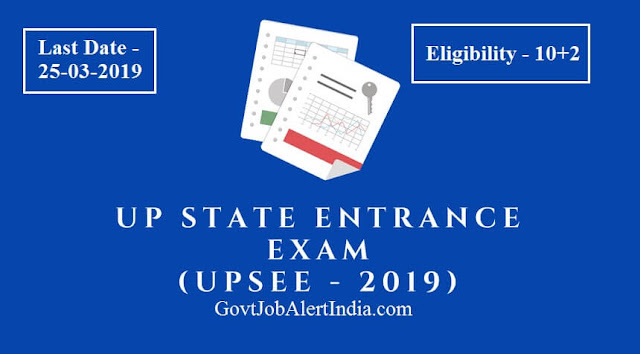 Abdul Kalam Technical University, Uttar Pradesh has announced a Latest Govt Jobs notification for the admissions of UG Programs through Uttar Pradesh State Entrance Exam, UPSEE. All the interested candidates who want to be part of this process, can check the examination details and apply online from 23-01-2019 to 25-03-2019. Educational Qualification: Candidates should have passed 10+2 or equivalent from recognised board. Application Fee: General candidates have to pay Rs. 1,300 and Female/PH candidates have to pay Rs. 650 through online mode using Net-banking/Credit or Debit Card. How to Apply for Latest Govt Jobs UPSEE 2019:: Interested and eligible candidates may apply online through UPSEE website - https://upsee.nic.in/- from 23-01-2019 to 25-03-2019.